This is not how most of us think of Pomona’s third and perhaps best known president, James A. Blaisdell, but like the rest of us, he was once a child, and unlike most of us, he had his likeness recorded at the age of about six in the form of a plaster bust. Blaisdell would grow up to become a minister, theologian and president of Pomona College from 1910 to 1927. Today he is perhaps best remembered as the principal founder of The Claremont Colleges consortium and the author of the quotes on Pomona’s gates. 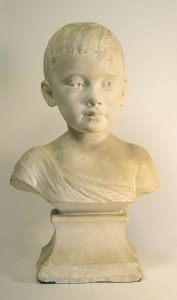 The bust, done in the classical style that was popular at the time (including clothing the boy as a child would have been clothed in Greek or Roman times), may have been intended to be cast in bronze, but no one knows whether this was ever done. Dating from around 1873, Blaisdell’s childhood likeness remained in the Blaisdell family until it was donated to the College this year by his great-granddaughter Susan Blaisdell Cornett. If you have an item from Pomona’s history that you would like to see preserved in the Pomona College Archives, please call 909-621-8138.